The cactus pear, also known as prickly pear (or by its Spanish name, tuna) is the fruit of the Opuntia cactus native to the southwestern US and Mexico. (The same succulent gives us cactus pads or nopales.) In the 16th century, the Opuntia cactus spread to the southern Mediterranean and Middle East, where the fruit acquired the name “Indian fig.” This thick-skinned fruit can vary in color from green to red to purple, and the vibrant magenta pulp contains many hard seeds. The flavor is melon-like and works well in salsas and juices, where the pureed pulp can be passed through a sieve to remove the seeds. 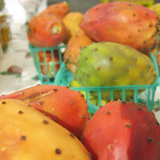 Look for cactus pears at the farmers market in May and June. A word of caution: mechanical methods of removing prickles are not foolproof. Peel cactus pears carefully as they are covered in tiny spines called glochids, which can be very irritating to your skin.